High Quality Content by WIKIPEDIA articles! 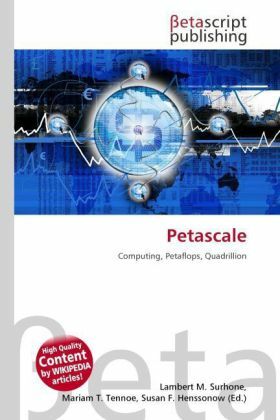 In computing, petascale refers to a computer system capable of reaching performance in excess of one petaflop, i.e. one quadrillion floating point operations per second. The standard benchmark tool is LINPACK and Top500.org is the organisation which tracks the fastest supercomputers. Some uniquely specialized petascale computers do not rank on the Top500 list since they cannot run LINPACK. This makes comparisons hard to ordinary supercomputers. Petascale can also refer to very large storage systems where the capacity exceeds one petabyte (PB).